meggipeg: StyleArc Tammy knit dress x3 and with a variation! 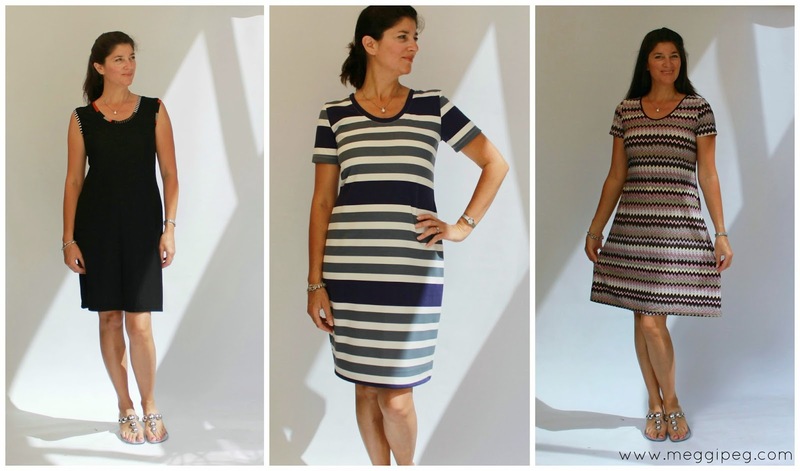 StyleArc Tammy knit dress x3 and with a variation! The StyleArc Tammy knit dress is such a simple pattern, but something about its stylish and flattering design has got me completely hooked. My first blue and white version has been in such high rotation that I could hardly wait for it to come off the washing line. It was time for some more Tammys. Ship Ahoy (she says in a desperate attempt to keep the poses interesting)! First up I have this nautical striped version made from ponte knit from Spotlight. I didn't change the sizing of the pattern, so it is marginally more snug-fitting than the other dresses I made from lighter-weight knits. It still fits really well though and check out that twin coverstitching! I spent some time contemplating where to place the stripes. I settled on having the wide stripe at the waist, but I think it could have been slightly lower. Still, it's quite good that the segment of navy stripe at the hemline is balanced by the navy at the neckline. I didn't think to match the stripes on the sleeves to those on the dress. Oh well. I am very pleased with the ponte dress, but it is way too warm to wear in our current heatwave, so I got stitching and made a cooler version. Enter the black, sleeveless version with stripy trim. This is made with a lovely, slinky, knit fabric that I bought at a Leona Edmonson sale a while back for $5. Being slinky it doesn't cling, so feels good to wear and skims over the lumpy bits. I just left off the sleeves when I made this dress, but ended up unpicking the armhole binding and lowering the armscye to make it more comfortable. The striped fabric is a scrap that I found in a $5 remnant bag from Potter's Textiles. There was just enough for the trim. I like that the stripes are uneven widths and colours. Finally, I modified the pattern slightly to create an a-line version. This, very blurry, phone picture shows the change I made to the pattern. The original pattern is on top and the modified one underneath. I followed the hip line and extended it outwards. 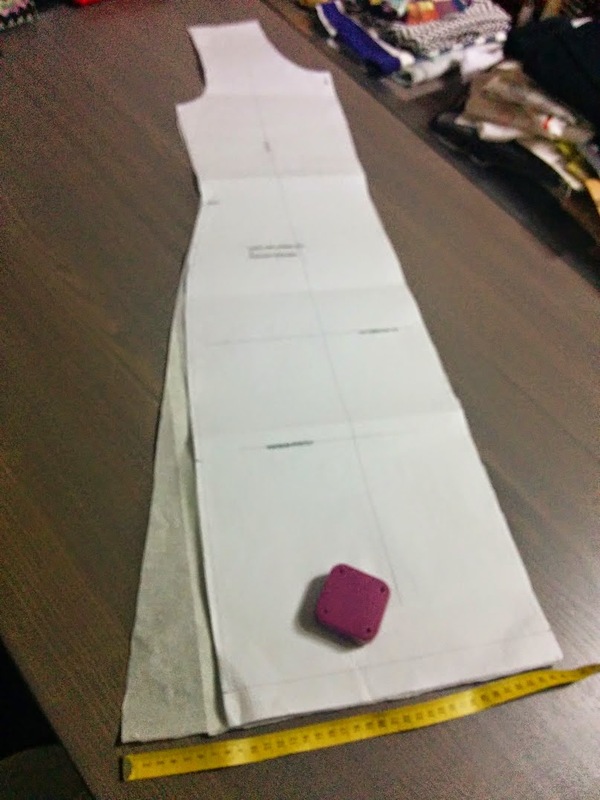 The tape measure shows that the increase at the hemline was 8cm. I used some fabric bought last year from Fabric.com. It's a drapey, stretchy, chevron print, which is a bit spongy, almost like a light-weight scuba knit. There are some glittery sparkles here and there. The neckline binding is plain brown lycra. The drapiness of the fabric has camouflaged the a-line effect somewhat. It would be more pronounced in a ponte so I've got one like that in mind for the cooler weather. I'm not sure that the colours are totally me, but I'm very happy with the dress overall. I just love this pattern. It goes together quickly and produces great results. With careful cutting, it can be made with a metre of fabric, so is economical too. It's the best thing to wear in Perth's meltingly hot weather, so hopefully no one is noticing that I'm wearing the same pattern several times a week! Also to note is that the Tammy pattern comes with a loose-fitting overlay top that I haven't even made yet. That will also be making an appearance in the cooler weather. NO need to rush with the washing now! Great wardrobe staples. Beautiful coverstitching! My fav is the black one with the striping bands. I have this pattern and didn't realise how versatile it is! Your three iterations are all gorgeous, and I also very much like the stripey bands. Oh these are all lovely. I have just placed an order with Style Arc and now I wish I had ordered this pattern too. All your versions are quite different and you would never guess they are all created from the same pattern. Also, I mean't to add that the stripe placement on the first dress is very flattering. I have just fallen in love with this pattern because of your versions! Love them all. I agree that the stripe placement on the first dress is spot on (stripe on?) The zigzag fabric for number 3 is lovely - how nice to have sneaked in a bit of glitter. Now you got me in the mood for summer (if we get one) and the wearing of cool dresses! Love all of these, especially the first one, and the use of the binding on the second one. I love all of the dresses and am envious of the warm weather you are having! With all your variations in fabrics, you'd never know that they were all from the same pattern. It's great to have such a versatile staple to fill the closet with! That black one is really great. Love the binding. All look fab. I might just have to check this pattern out. Great use of the pattern. I love the first striped dress.